Right on the Nail: Nibs & Nails Presents Great Lakes Lacquer in Lightning Streaks Blue and The Shimmering Gold Sea (Inspired by Diamine) Swatches + Giveaway! 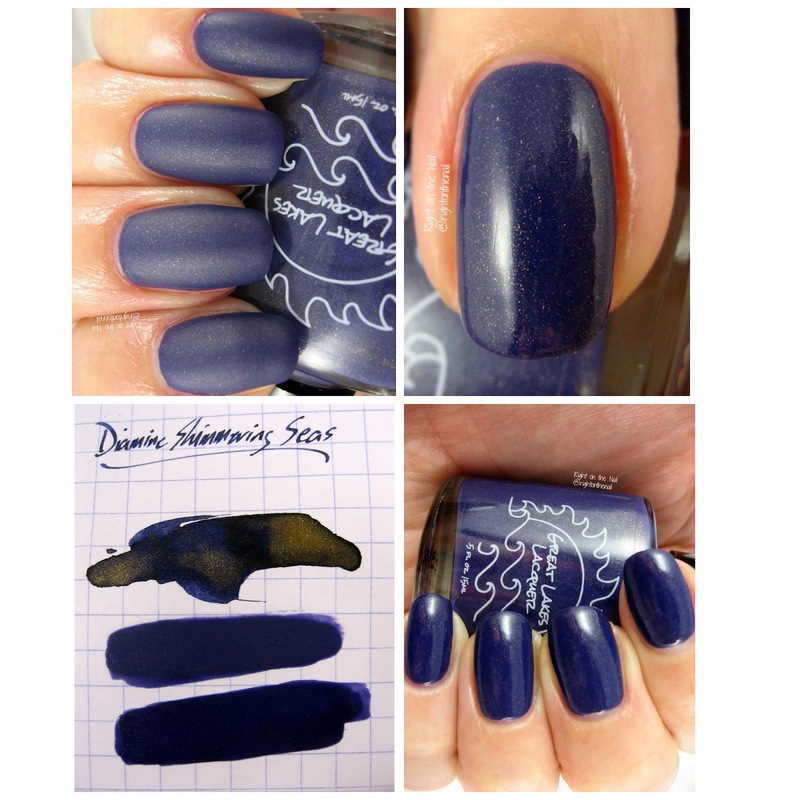 Nibs & Nails Presents Great Lakes Lacquer in Lightning Streaks Blue and The Shimmering Gold Sea (Inspired by Diamine) Swatches + Giveaway! Hi guys! Welcome back to yet another week of Nibs & Nails where we ask indie makers to dupe (or just be inspired) by popular fountain pen inks. Don't forget, last week's giveaway from Heather's Hues ends tonight at midnight so enter now! Tonight I welcome one of my favorite brands, Great Lakes Lacquer. If you haven't seen my swatches of her 1-year anniversary collection called The Great Ones from this past Sunday, you can see those here. Obviously she can rock a blue polish, so I asked her to work on 2 inks from the Diamine Shimmertastic set called Blue Lightning and Shimmering Seas. Stay with me to the end of the post to see how you can win these polishes (you will also be able to purchase your own set from Great Lakes Lacquer next week)! 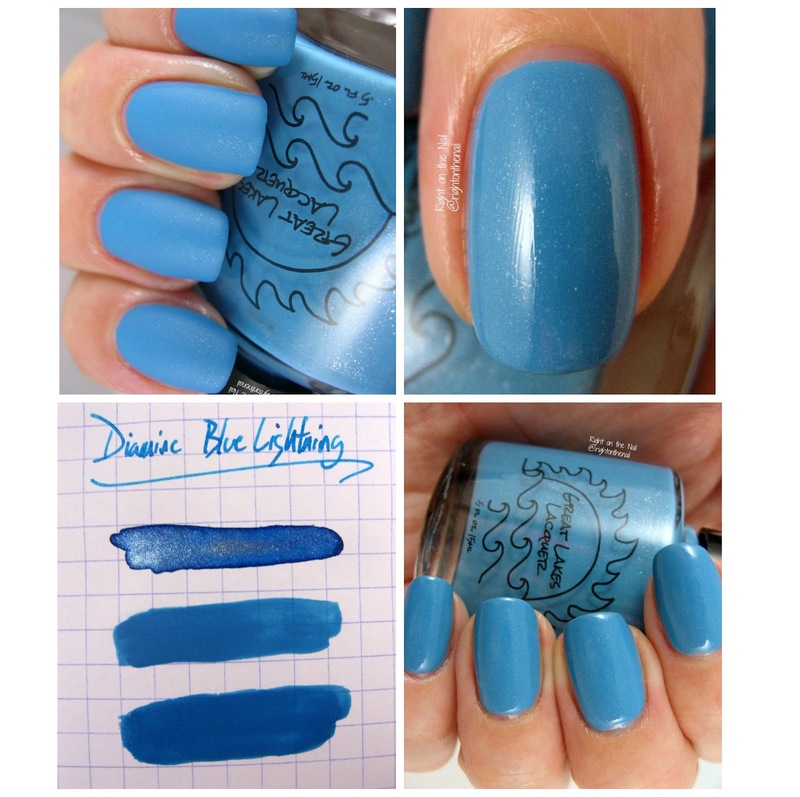 As always, my husband has his reviews of the inks on his blog (Inkdependence), so feel free to click here for more about Blue Lightning and here for Shimmering Seas. 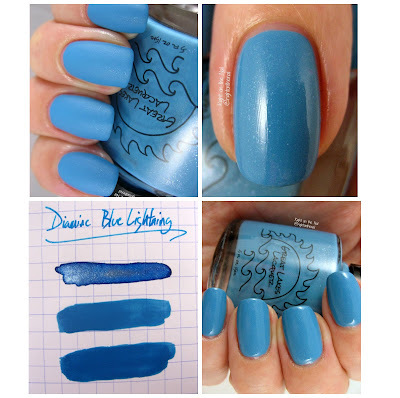 Like Majestic Blue last week, Blue Lightning has some nice dark shading around the edge of the ink swatch that you just can't recreate with nail polish. The matte topcoat seemed to lighten the polish a bit, but you can still see the silver shimmer throughout. My husband got a little crazy with the amount of ink he put down which is why there is a massive amount of silver shimmer. Either way, Mariah did an amazing job with color-matching here. The polish may be a little lighter on the shimmer than the ink, but that's pretty much it. Lightning Streaks Blue is a deeper turquoise blue with subtle hints of silver shimmer. Gorgeous! It dries just slightly darker than the bottle color and the formula was perfection in just 2 coats. Is it just me, or do indies generally have a better formula than most mainstream brands these days? The matte version is definitely lighter and dries to the bottle color. Weird, huh? Squee, I love this one! I was in constant contact with Mariah throughout the process and there was a bit of an issue in the beginning with certain gold shimmers looking a bit green (blue + yellow = green, right?). I didn't even think about that being an issue! It makes me admire these indie makers even more. Just think of all the pigments, shimmers, glitters, and flakes they have to deal with when making new colors! Anyway, they call the ink a blue-black color, but I think it's more of a navy blue with gold shimmer. The matte version looks very similar to the ink, right? I think it tends to bring out the shimmer more. And yes, there's another giveaway this week! There will be 2 winners, 1 for each polish. If that's not enough, Mariah was kind enough to offer these polishes to everyone. You will be able to get them for $8.50 each or $15 for the duo. They will be for sale next Friday, July 22nd on her Etsy site and will be up until August 15th. I like both indie and mainstream brands, but if I have to choose, I'm still a drugstore polish kind of girl myself. There's nothing quite as immediately gratifying as "I see I want I get" :). I have an indie on my fingers and a mainstream on my toes right now, so I'm proof they can live together in happy harmony :). Since I would give them to my niece, I prefer indies. Others she could find on her own. I buy indies almost exclusively. Every now and then I find a mainstream color that appeals to me but the variety and inventiveness that you see in indies is missing in most mainstreams. I love indies, and have the collection to prove it! These are gorgeous! For the last four years, it has been indies all the way for me! So many finishes that mainstreams just ignore can be found in indie-land. I prefer indie brands - I love the options and the relationships I have built and I also really like the idea of helping support small businesses. Indie polishes are my favorite polishes by far! Indie Polish for sure! I'm all about supporting small business and eliminating products that do any sort of animal testing, or that are part of a parent company that does animal testing. I know I don't have to worry about that with my indie brands!